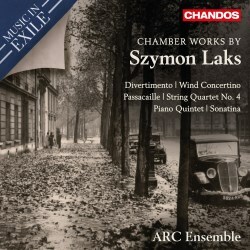 Chandos’ Music in Exile series has explored the chamber music of Paul Ben-Haim and Jerzy Fitelberg and now shines light on Szymon Laks. Born in Warsaw, whose conservatory he graduated in 1925, he gravitated to Paris and immersed himself in the city’s milieu. In May 1941 he was interned, and in 1942 sent to Auschwitz-Birkenau where he managed to become conductor of the orchestra. Here, despite the horrendous circumstances, he learnt an orchestration technique called ‘odeon’ - which, in effect, allowed him to perform a work with different permutations, which, given the prevailing circumstances, was important. At war’s end Laks made his way back to Paris where he remained for the rest of his life. The six works here range in compositional date over the four decades from 1927 to 1967. The String Quartet No.4 (1962) is a dapper, jazzy piece, elegant and witty – not too far away from Tansman or Martinů – and the lyrical introspection of the central slow movement with its undulating line is most attractive. A free, lively, very French clarity animates the finale. Composed in 1967 the Divertimento, which exists in two versions with slightly different instrumentation, again reflects qualities of clarity and order coupled with ingratiating tunes that situate it very much in the traditions of French wind composition. The pawky bassoon and clean-limbed clarinet are notable, as are the pensively beautiful slow movement and the sophisticated wit and neo-classicism of the finale. The earliest work is the 1927 Piano Sonatina, which fits snugly in the Ravelian lineage – crisp, taut, energetic with a Lento non troppo that prefigures the Concerto in G – and a finale that seems to hint at Debussy’s influence. The Concertino is cut from the same kind of cloth as Poulenc and Françaix, with felicitous exchanges and a quotient of drollery in the writing, whilst the Passacaille of 1945 is heard in this version for cello and piano not voice and piano. Largely reflective it peaks in a passionate outburst. The Piano Quintet is an arrangement of his String Quartet No.3, a kind of divertimento of Polish melodies that Tansman might well have written. Though essentially genial there are passing and some quite deep shadows, though the lovely slow movement with dappled piano writing and the genial pizzicato-crazed scherzo offer rewards. The folkloric quota is at its highest in the agitato finale. The ARC Ensemble reveals every glint and Gallic facet of Laks’ muse, supported by a good recording and documentary notes. Whether Laks’ assimilation of French models suppressed his own Polish identity or whether he was, from early adoption, in effect a French composer – he became a French citizen in 1947 – of Polish birth perhaps doesn’t much matter. His music remains lissom, clean cut and enjoyable.